When you get your hands on this guide and actually start putting the methods into ACTION you will start to see higher search engine rankings for just about any keyword you choose. Picture this! In just a week or so of implementing these secret techniques you will go from a "Search Engine Nobody" to a "SEO King". Meaning, you pick a site and you carefully select your keywords and BAM, page 1 rankings. Now don't get me wrong, that process sounds easy but it actually requires some work, but as they say, "Practice makes perfect!" 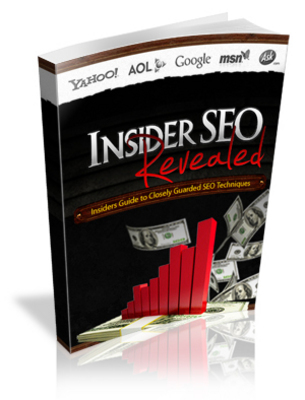 Here's what you WON'T find in "Insider SEO Revealed"... NO B. S., NO Junk and NO Hype. Just a very informational, step-by-step guide on developing a highly paid skill, which is Search Engine Optimization! * I will teach you different secrets that will get you ranked high in the search engines in no time! * Not Tech Savvy? No problem, Im going to show how to use automated software tools to do the work for you! * How to show up in the Search Engines within a matter of days, NOT weeks! * Secret method to getting indexed within 24 hours! * All the SEO tools that I use to help me rank faster and more efficiently. * With this system it is easy to follow. You wont have any trouble following along! Step-by-step guide with no junk included! * OH Yes.There is Much Much More! I know youre tired of all the SEO guides promising things that will never happen! I can guarantee if you follow my step by step system you won't have to buy another SEO guide EVER! Now how many of the SEO gurus can say something's like that? You see, the plan is simple ...dominate the search engines so you can have traffic coming from all angles of the web! About a month ago, I reached my goal of grabbing over 500 daily visitors from the search engines, using the same system found within Insider SEO Revealed! * You should only buy SEO products from experts that actually know Search Engine Optimization! Built of FACTS, not theory! * Take a look at some testimonies of the product see what others have to say, how it worked for them! If you see others ranking high with a certain method follow their success! * When implementing methods make sure their not things that will get you banned from the search engines. There are guides out there that will show you ways to rank high but at the same time get you banned! If you get banned then what. * Follow Success! Try new things keep an open mind, dont let anyone tell you it wont work. Youre in charge of your success!